Vermont Gas has marked the wetland areas in Geprags Park, in Hinesburg, through which the company plans to build. The wetlands are state-designated, and residents say the chosen route for the pipeline would be devastating for a rich ecosystem. A group of Hinesburg residents got legal standing last week to fight Vermont Gas Systems on the company's effort to build a pipeline through a town park. They say the chosen route for the pipeline would be devastating for a rich ecosystem that includes state-designated wetlands. From the road, Geprags Park looks like a big field with some high-transmission power lines running over its center. The field is flanked on either side by wooded areas — on the eastern side, a gentle rise leads to a network of trails through the woods. On the western side, a small stream flows through a wetland. Bob Hyams is on the Hinesburg Conservation Commission, which is responsible for the park. From the middle of that field, he says he can see how a pipeline could go through. "You could visualize construction equipment out here,” he says. “You could visualize taking off the top soil, stockpiling it, putting it back in place, seeding it down, and a few years later it's going to look like field again." 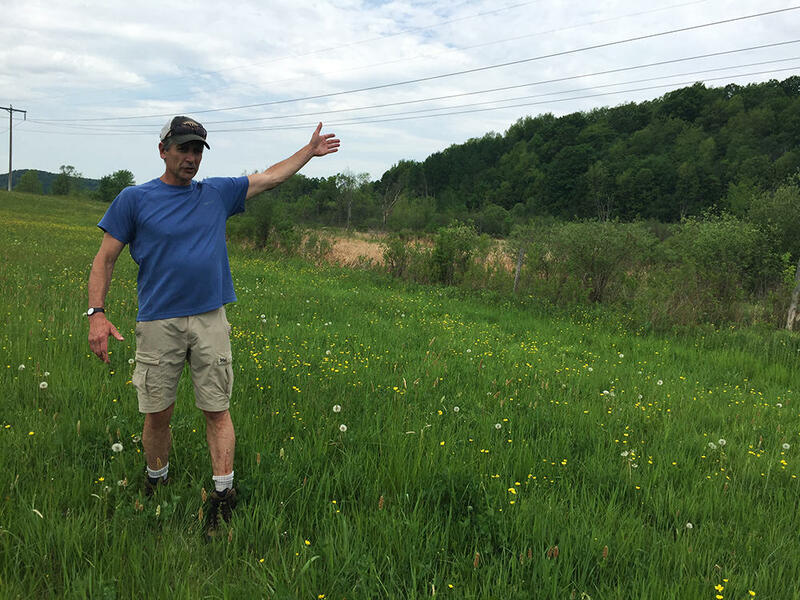 Bob Hyams, a member of Hinesburg's conservation commission, stands in a field where he thinks the Vermont Gas pipeline could be routed to avoid damaging rich natural habitat. But that's not where Vermont Gas wants to put its pipeline. The company is trying to get legal right-of-way to lay a pipeline through the western side of the park. A state-designated wetland runs the entire length of the park on this western side, which is longer than the eastern side, and stretches back further from the road than the rest of the park. On a walk along the proposed pipeline route, Hyams says this part of the park makes a great ecosystem for birds and other wildlife. Hyams and others are concerned about what would happen to the wetland and surrounding environment if Vermont Gas builds a pipeline through it. There are also questions about the process that led the company to choose the only strip of the park that is state-designated wetland from end to end. This map from the Vermont Agency of Natural Resources shows the wetland running through the western side of Geprags Park. Vermont Gas didn’t do this by accident. CEO Don Rendall says the pipeline follows the right of way already occupied by the Vermont Electric Power Company (the high-capacity power lines over the middle of the park) for most of the pipeline, but Vermont Gas deviated from that path specifically for this stretch. Rendall says they did it to avoid wetlands. After VPR published this story, Vermont Gas sent this map of the pipeline's proposed route through the wetlands in Geprags Park in Hinesburg. VPR requested maps that show how the pipeline route crosses through the park, and where the route is relative to designated wetlands. Vermont Gas did not provide any such maps until after the story was published, when spokeswoman Beth Parent sent a map to support her assertion that VPR's story is "very inaccurate." In fact, Vermont Gas produced an eight-page report for the town of Hinesburg in May explaining the siting decision, but neither CEO Don Rendall nor Parent mentioned the report before VPR published this story. “There is a wetland area right in the VELCO easement, and by rerouting this part of the project through the part area outside of the VELCO easement we were able to avoid some sensitive wetland areas,” he says. So the company moved the pipeline route to the west. Walking along the proposed route, Hyams says he has trouble seeing how it's better than the VELCO right of way. In other words, Vermont Gas specifically decided to move the pipeline away from a small section of wetland on a wide open grassy field to a large section of wetland right up against a hill. “I find it curious that they could go to such lengths developing a plan, and then after the plan is developed, then they come in and delineate the wetlands, which seems sort of bass-ackwards to me,” he says. Bill Marks is another member of the conservation commission, and he’s also one of seven residents granted legal standing by the Public Service Board last week, allowing them to bring a legal case against the pipeline coming through the park. Marks says they have a pretty strong case. “The ... particular problem Vermont Gas will have in trying to go through the park, dates back most directly to a 1928 Supreme Court case,” Marks says. The case he's talking about was Middlebury College against a company called Central Power, which was trying to build in a park the college owned. The power company lost, and Marks says that set the precedent that could stop the Vermont Gas pipeline. “Land that is already dedicated to public use cannot be infringed upon — cannot be taken by eminent domain — and diverted to another public use,” Marks says, explaining the ruling. Vermont Gas CEO Don Rendall didn't say how the company plans to handle that legal challenge. Because of the ongoing legal issues, Rendall also couldn't say for sure if the project will be finished by the end of the year or within the $154 million budget the company has set itself. Rachel Smolker is part of the citizen group as well, and she doesn’t think the pipeline should be built at all. She says reading about the hydraulic fracking process used to harvest natural gas, as well as about the role of methane in climate change, was enough to get her involved. Update 10:40 a.m. This story was updated to reflect that Vermont Gas provided a map of its proposed route through the wetlands. Utility regulators may require Vermont Gas Systems to get a new permit for its natural gas pipeline to Addison County, according to an order issued last week. Will the Legislature convene a veto session next month? It’s the question that’s on a lot of people’s minds in Montpelier these days, but it’s still unclear whether concerns about a renewable energy siting bill will trigger a gubernatorial veto, or what happens to the legislation if it does. The Vermont Gas Systems pipeline is embroiled in a public controversy as well as a complex and slow-moving regulatory battle. Environmentalists are engaged in a public campaign to defeat the project, claiming that the state should be advancing renewable energy infrastructure, not fossil fuel infrastructure.